By 1613, when Michael Romanov, the first Tsar of the Romanov Dynasty, was crowned, the Russian regalia included a pectoral cross, a golden chain, a barmas (wide ceremonial collar), the Crown of Monomakh, sceptre, and orb. Over the centuries, various Tsars had fashioned their own private crowns, modeled for the most part after the Crown of Monomakh, but these were for personal use and not for the coronation. In 1719, Tsar Peter the Great founded the earliest version of what is now known as the Russian Federation's State Diamond Fund. Peter had visited other European nations, and introduced many innovations to Russia, one of which was the creation of a permanent fund (фонд) to house a collection of jewels that belonged not to the Romanov family, but to the Russian State. Peter placed all of the regalia in this fund and declared that the state holdings were inviolate and could not be altered, sold, or given away—and he also decreed that each subsequent Emperor or Empress should leave a certain number of pieces acquired during their reign to the State, for the permanent glory of the Russian Empire. From this collection came a new set of regalia, including eventually the Great Imperial Crown, to replace the Crown of Monomakh and other crowns used by earlier Russian Tsars and Grand Princes of Muscovy, as a symbol of the adoption of the new title of Emperor (1721). 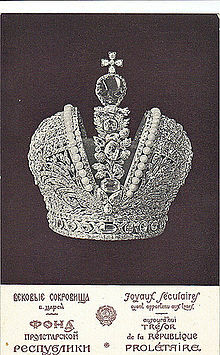 The court jeweller Ekart and Jérémie Pauzié made the Great Imperial Crown for the coronation of Catherine the Great in 1762. The beautiful crown reflects Pauzié's skilled workmanship. It is adorned with 4936 diamonds arranged in splendid patterns across the entire surface of the crown Bordering the edges of the "mitre" are a number of fine, large white pearls. The crown is also decorated with one of the seven historic stones of the Russian Diamond Collection: a large precious red spinel weighing 398.72 carats (79.744 g), which was brought to Russia by Nicholas Spafary, the Russian envoy to China from 1675 to 1678. It is believed to be the second largest spinel in the world. In formally adopting the Western term "Emperor" for the ruler of Russia, Peter the Great also adopted Western imperial symbols, including the form of the private crowns (Hauskrone) used by the Holy Roman Emperors (of which the only surviving example is the Austrian imperial crown of Rudolf II, the Imperial Crown of Austria), in which a circlet with eight fleur-de-lis surrounds a mitre with a high arch extending from the front to the back fleur-de-lis. Already in Austria some baroque representations of this type of crown found on statues of the saints had already transformed the two halves of the mitre into two half-spheres, and this is the type of imperial crown used in Russia. Peter’s widow and successor, Catherine I, was the first Russian ruler to wear this form of imperial crown. In the Great Imperial Crown which the court jewellers Pauzié and J. F. Loubierin made for Catherine II in 1762, these hemispheres are in open metalwork resembling basketwork with the edges of both the hemispheres bordered with a row of 37 very fine, large, white pearls. They rest on a circlet of nineteen diamonds, all averaging over 5 carats (1.0 g) in weight, the largest being the large Indian pear-shaped stone of 12⅝ cts in front, set between two bands of diamonds above and below. Posier showed his creative genius by replacing the eight fleur-de-lis with four pairs of crossed palm branches, while the arch between them is made up of oaks leaves and acorns in small diamonds surrounding a number of large diamonds of various shapes and tints  running from the front pair of crossed palms to the back pair of crossed palms, while the basketwork pattern of the two hemispheres are divided by two strips of similar oak leaves and acorns from the two side pairs of palm branches stretching up to the rows of large pearls on their borders. At the center and apex of the central arch is a diamond rosette of twelve petals from which rises a large red spinel, weighing 398.72 carats (79.744 grams), one of the seven historic stones of the Russian Diamond Collection, which was brought to Russia by Nicholas Spafary, the Russian envoy to China from 1675 to 1678. It is believed to be the second largest spinel in the world. This spinel, in turn, is surmounted by a cross of five diamonds, representing the Christian faith of the Sovereign, the God-given power of the monarchy and the supremacy of the divine order over earthly power. Except for the two rows of large white pearls the entire surface of the crown is covered with 4936 diamonds and is quite heavy, weighing approximately nine pounds (by contrast, the Crown of Monomakh weighs only two pounds). It was unfinished in time for Catherine's coronation and the original colored stones (e.g., emeralds in the palm branches and laurel leaves) were replaced with diamonds for the coronation of Paul I in 1797. It was used at every subsequent coronation until that of Nicholas II in 1896 and was last in imperial period at the State Opening of the Duma in 1906. There was also a Lesser Imperial Crown, very similar in style and workmanship to the Great Imperial Crown, only smaller and entirely set with diamonds, made for Empress Maria Feodorovna, the consort of Paul I, that was used for the coronation of the Tsarina. At the coronation of Nicholas II in 1896, the smaller crown was worn by Dowager Empress Maria Feodorovna, as was her right as a crowned Empress. A second identical lesser Imperial Crown was made for the young Empress Alexandra Feodorovna to wear. Dowager Empresses outranked reigning Empress Consorts at the Russian Court. In 1900, the workshop of Peter Carl Fabergé in St. Petersburg made a replica in miniature of the Imperial Regalia (the Great Imperial Crown, the Lesser Imperial Crown, the Imperial Orb and Sceptre) out of silver, gold, diamonds, sapphires, and rubies, the whole set on a marble pedestal. The work is now in the collection of the Hermitage Museum. Following the tradition of the Byzantine Emperors, the Tsar of Russia placed the crown upon his own head. This left no doubt that, in the Russian system, the imperial power came directly from God. The prayer of the Metropolitan, similar to that of the Patriarch of Constantinople for the Byzantine Emperor, confirmed the imperial supremacy. A few days prior to the crowning service itself, the Tsar made a processional entry into Moscow, where coronations were always held (even when the capital was in St. Petersburg). Following this, the Imperial regalia were brought from the Kremlin armory into the Tsar's Kremlin palace, where they would accompany the new emperor on his procession to the Dormition Cathedral on the morning of his coronation. This procession commenced at the Red Porch and ended at the church doors, where the presiding prelate and other bishops blessed the Tsar and his consort with holy water and offered them the Holy Cross to kiss. Most God-fearing, absolute, and mighty Lord, Tsar of all the Russias, this visible and tangible adornment of thy head is an eloquent symbol that thou, as the head of the whole Russian people, art invisibly crowned by the King of kings, Christ, with a most ample blessing, seeing that He bestows upon thee entire authority over His people. Following this, the new Tsar crowned his consort, first briefly with his own crown (by touching it momentarily to her head before putting it back on his own), then with a smaller crown of her own. Further prayers and litanies were read, then the Emperor was anointed just prior to reception of Holy Communion during the Divine Liturgy. He was invited to enter the altar area through the Royal Doors (normally reserved solely to the clergy) and partake of Communion as a priest would. Further prayers and blessings concluded the service, which was followed by a special feast held in the Kremlin's Palace of Facets. Russia's last coronation was in 1896, for Tsar Nicholas II and Empress Alexandra. The last occasion on which the Great Imperial Crown was officially used was the State Opening of the Duma in 1906. The Silk Imperial Crown of Russia was given as an official coronation gift of the Russian Empire at the 1896 coronation of Nicholas II, the last emperor to rule in Russia. Nicholas II was the first and only monarch to be presented with such a monumental coronation gift. It was not intended as ceremonial regalia but as private Imperial property as a memento of his coronation event. In 1913, Agathon Fabergé, son of Peter Carl Fabergé of the House of Fabergé, the crown jewellers, recommended that the Imperial regalia be re-catalogued and overhauled. 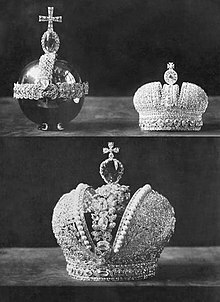 The tsar gave his approval and by July 1914, work on the Imperial orb and sceptre had been completed, and work was about to commence on the crowns. Rising tensions and the outbreak of the First World War put a stop to further work, and the regalia items were loaded into nine strong-boxes and sent from Saint Petersburg to Moscow for safekeeping. They were stored in the Kremlin Armoury. The crown remained there with the rest of the regalia during and after the February and October Revolutions in 1917. 'No', said one of the workmen, '5 pounds at most - try it,' and placed it straight away on my head. The Imperial Crown appeared on the National emblems of the Russian Empire—the Great Coat of arms (Большой государственный герб Российской Империи), the Medium Coat of Arms (Средний государственный герб Российской Империи), and the Lesser Coat of Arms (Малый государственный герб Российской Империи) of Imperial Russia. The Great Imperial Crown was placed above the Imperial Cypher (monogram)—but only after the coronation. After ascending the throne, but before the coronation, the Imperial Cypher would bear the princely crown, but not the Imperial Crown. The crown was also placed on the arms of Congress Poland, a puppet state ruled by the Russian Empire (1814–1915), and the Privislinsky Krai which was incorporated into the empire in 1831. Since December 20, 2000, the Imperial Crown has appeared on the coat of arms of the Russian Federation. The crown has also had a number of unofficial uses in advertising, particularly for various brands of vodka and caviar. ^ The crown is styled after the Monomakh Cap and was made for Tsar Michael Fyodorovich by Kremlin masters in 1627. The orb and sceptre are of Western European origin and may have been given to Tsar Boris Godunov in 1604. ^ "pectoral cross". Kreml.ru. 1997-11-28. Retrieved 2012-10-09. ^ "golden chain". Kreml.ru. 1997-11-28. Retrieved 2012-10-09. ^ "barmas". Kreml.ru. 1997-11-28. Retrieved 2012-10-09. ^ "sceptre". Kreml.ru. 1997-11-28. Retrieved 2012-10-09. ^ "orb". Kreml.ru. 1997-11-28. Retrieved 2012-10-09. ^ "other crowns". Kreml.ru. 1997-11-28. Retrieved 2012-10-09. ^ Including at the bottom of the arch in the front, a perfect 56 carats (11.2 g) diamond with a slight tint that had belonged to the Empress Elizabeth; above it another large brilliant of 41.3125 carats (8.26250 g); a four-sided brilliant of 18.375 carats (3.6750 g); a pink pendant of 21.875 carats (4.3750 g) and a bevelled four-sided oblong stone of 17.375 carats (3.4750 g), while from the back bottom is found a triangular Indian-cut brilliant of pinkish-blown tine of 17 3/16 cts; an oval boat-shaped bluish-white stone of 17⅛ cts; a long pendant with a light golden tint of 12¼ cts; a perfect, white rhomboid of 16½ cts and a four-sided thick stone of pink water of 12¼ cts. ^ The largest and the fourth largest spinels weigh respectively 500 cts. and 270 cts. and are among the Iranian Crown Jewels; the third largest spinel is the Timur Ruby of 283 cts. in the Royal Collection of the British monarchy. ^ R. Monk Zachariah Liebmann, "Martyrology of the Communist Yoke: The Life of Tsar-Martyr Nicholas II", The Orthodox Word, 153 (1990), 193–4. 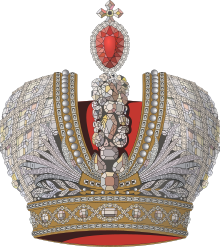 ^ The Imperial Crown of Russia (1763) Archived 2011-06-11 at the Wayback Machine, accessed 2007-06-18. ^ a b Clarke. The Lost Fortune of the Tsars. p. 151. ^ Clarke. The Lost Fortune of the Tsars. p. 152. ^ Clarke. The Lost Fortune of the Tsars. p. 172. ^ Clarke. The Lost Fortune of the Tsars. p. 173. ^ See for example, http://www.romanovrussia.com/MFcobaltEgg.html. Clarke, William (1994). The Lost Fortune of the Tsars. London: Weidenfeld & Nicolson. ISBN 0-297-81434-6. The Kremlin Armoury, is one of the oldest museums of Moscow, established in 1851 and located in the Moscow Kremlin, now a part of Moscow Kremlin Museums. Monomakh's Cap, also called the Golden Cap, is a chief relic of the Russian Grand Princes and Tsars. 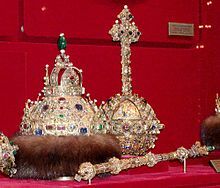 It is a symbol-crown of the Russian autocracy, and is the oldest of the crowns currently exhibited at the Kremlin Armoury. Monomakh's Cap is an early 14th-century gold filigree skullcap composed of eight sectors, elaborately ornamented with a scrolled gold overlay, inlaid with precious stones and pearls, and trimmed with sable. The cap is surmounted by a simple gold cross with pearls at each of the extremities. The Saint Basil's Cathedral Egg is a jewelled Easter egg made under the supervision of the Russian jeweller Peter Carl Fabergé in 1906 for Tsar Nicholas II of Russia. It was presented by Nicolas II as an Easter gift to his wife, the Czarina Alexandra Fyodorovna. It is currently held in the Kremlin Armoury Museum in Moscow, and it is one of the few Fabergé eggs that have never left Russia. The Alexander III Equestrian egg is a jewelled Easter egg made under the supervision of the Russian jeweller Peter Carl Fabergé in 1910, for the last Tsar of Russia, Nicholas II. The Imperial Coronation egg is a jewelled Fabergé egg made under the supervision of the Russian jeweller Peter Carl Fabergé in 1897 by Fabergé ateliers, Mikhail Perkhin and Henrik Wigstrom. The egg was made to commemorate Tsaritsa, Empress Alexandra Fyodorovna. 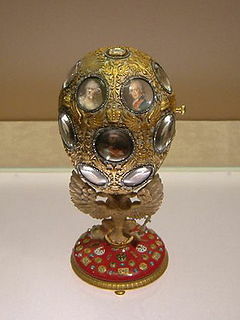 The Peter the Great Egg is a jewelled Easter egg made under the supervision of the Russian jeweler Peter Carl Fabergé in 1903 for the last Tsar of Russia, Nicholas II. Tsar Nicholas presented the egg to his wife, the Czarina Alexandra Fyodorovna. The egg is currently located at the Virginia Museum of Fine Arts in Richmond, Virginia, in the United States. The Steel Military egg is one of a series of approximately 50 Russian jewelled Easter eggs created under the supervision of the Russian jeweller Peter Carl Fabergé. This particular egg was delivered to Alexandra Fyodorovna, the Russian Tsarina, on Easter Eve of 1916 on behalf of the last Tsar of Russia, Nicholas II by Fabergé's son Eugène while Nicholas II was away at the Russian front of World War I; Carl Fabergé was himself busy delivering the other Easter egg for 1916, the Order of St. George Egg, to Nicholas's mother, the Dowager Empress Maria. It is one of only ten Imperial eggs that were not sold following the Russian Revolution and subsequent execution of the immediate Imperial Romanov family, and is now held in the collection of the Kremlin Armoury. The Romanov Tercentenary Egg is a jewelled Easter egg made under the supervision of the Russian jeweller Peter Carl Fabergé in 1913, for Tsar Nicholas II of Russia. It was presented by Nicolas II as an Easter gift to his wife, the Tsaritsa Alexandra Fyodorovna. It is currently held in the Kremlin Armoury Museum in Moscow. The Empress Crown is part of the coronation regalia used by the only Shahbanu (Empress) of Iran, Farah Pahlavi. It is part of the Iranian Crown Jewels and is currently on display at the Central Bank of Iran in Tehran. 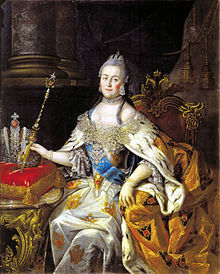 The Emperor or Empress of All Russia was the absolute and later the constitutional monarch of the Russian Empire. Jérémie Pauzié was a Genevan diamond jeweler, artist and memoirist, known for his work for the Russian Imperial court and the Imperial Crown of Russia, which he created with the court's jeweler Georg Friedrich Ekart. The coronation of Emperor Nicholas II and his wife, Empress Alexandra Feodorovna was the last coronation during the Russian Empire. It took place on Tuesday, 14 May 1896, in Dormition Cathedral in the Moscow Kremlin. Nicholas II, known in Russian as Nikolai II Aleksandrovich, was the last emperor of Russia.